Steel plant has many metallurgical processes which take place at high temperatures. Further many of these processes handle raw materials some of them are in the form of fines. Hence all these processes are prone to emit pollutant gases and particulate matter into the atmosphere. This in turn affects the quality of air around the plant. In order to improve and protect the quality of air, different pollution control devices are used for reduction of the emissions. Earlier for many years, pollution control equipments were used only for those processes where the pollutants amounts were very high or they were toxic in nature. These equipments were also earlier used where they had some recovery value. But today, with the environment laws becoming more and more tighter and with the increasing concerns of the society regarding the environment, it has become necessary for the steel industry to look into its emissions and install equipments in all the areas to reduce the emissions to minimum possible levels. The emission control equipments are basically of two types (i) particulate emission control equipments and (ii) gaseous emission control equipment. This article describes the particulate emission control systems. Settling chambers was one of the first devices used to control the particulate emissions. However it is very rarely used today since its effectiveness in collecting particles is very low. The collection force in settling chamber is gravity. Large particles moving slow enough in a gas stream can be overcome by gravity and gets collected in the settling chamber. The unit is constructed as along horizontal box with an inlet, chamber, outlet and dust collection hoppers. The velocity of the particle laden gas stream is reduced in the chamber. All the particles in the gas stream are subject to the force of gravity. At the reduced gas velocity in the chamber, the larger particles (larger than 40 micro meters) are overcome and fall into hoppers. It is mainly used as a precleaner for other particle emission control devices to remove very large particles. Cyclones are simple mechanical devices which are commonly used to remove relatively large particles from gas streams. They are used as precleaner for more sophisticated air pollution control equipment such as electrostatic precipitators or bagfilters. Cyclones are more efficient than settling chambers. Collection forces used for particle collection in a cyclone are centrifugal and gravitational forces. The shape or curvature of the cyclone causes the gas stream to rotate in a spiral motion. Larger particles move toward the outside of the wall by virtue of their momentum. The particles lose kinetic energy there and are separated from the gas stream. These particles are then overcome by gravitational force and falls down to get collected. Inlet of the cyclones is designed to change the flow pattern of the incoming gas from straight flow into a circular pattern to form the vortex. In case of multicyclone, axial cyclones are used in parallel. In axial cyclones, the gas enters from the top and is directed into a vortex pattern by the vanes attached to the centre tube. In multicyclone dirty gas enters uniformly through all the individual cyclones. Bagfilters use a filter material such as nylon or wool to remove particles from the dust laden gases. The particles are retained on the fabric material. While the clean gas passes through the material. The collected particles are then removed from the fabric filter by a cleaning mechanism which is either the mechanical shaking or by use of air blast. The removed particles are stored in a collection hopper. Various fiber materials used in bagfilters along with their properties are given in Tab 1. 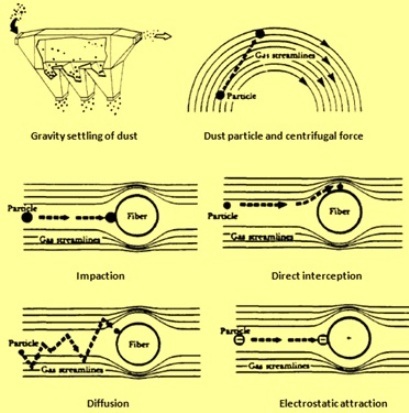 In bagfilters, three separate forces namely impaction, direct interception and diffusion are responsible for particle removal from gases and their collection. Impaction occurs when the particle is so large that it cannot follow the gas stream and hits or impacts on the fiber of the bagfilter and get separated from the gas stream. In case direct impaction, the particle follow the gas stream around the fibers till a collision occur due to the distance between the particle centre and the fiber being less than the particle radius. Diffusion occurs because of very small particles undergo Brownian motion throughout the gas volume. Very small particles become affected by collision of molecules in the gas stream. These randomly moving particles diffuse through the gas to impact on the fiber and get collected. Bagfilters usually have large numbers of cylindrical fiber bags which hangs vertically in the bagfilter. When dust layers have built up to a sufficient thickness, the bags are cleaned, causing the dust particles to fall into a collection hopper. Bags can be cleaned by a number of methods. The three most common methods are shaking, reverse air and the pulse jet. In the mechanical shaking, the bags are gently shaked by a drive system for the removal of the deposited dust. In the reverse air cleaning mechanism, the bagfilter compartment is backwashed with a low pressure flow of air. Dust is removed by merely allowing the bags to collapse. Pulse jet cleaning mechanism is the most popular mechanism. It uses a high pressure jet of air to remove the dust from the bag. The dust cake is removed from the bag by a blast of compressed air injected into the top of the bag tube. The blast of the high pressure air stops the normal flow of air through the filter. The air develops into a shock wave that causes the bag to flex or expand as the shock wave travels down the bag tube. As the cake flexes, the cake fracture and the deposited particles fall from the bag. The shock wave travels down and back up the tube in about 0.5 seconds. The blast of the compressed air should be strong enough to travel the length of the bag and shatter or crack the dust cake. Bagfilters bag has a life and needs replacement when this life is over. Three conditions affect the life of the bags adversely. These are abrasion, high temperature and chemical attack. One of the important variables in the design of a bagfilter is air to cloth ratio. Very high air to cloth ratio results into excessive pressure drops, reduced collection efficiency, bags becoming caked solidly with dust and rapid bag deterioration. Electrostatic precipitators (ESP) are used to collect particles with diameters in size range 0.1 micro meters to 10 micro meters. Its collection efficiency is high and sometimes exceeds even 99 %. ESPs can handle large exhaust gas volumes at temperatures 175 deg C to 700 deg C.
The particle collection mechanism involved in an ESP is electrostatic force. The dust particles suspended in flue gas are charged as they pass through the ESP. A high voltage, pulsating, direct current is applied to an electrode system consisting of a small diameter discharge electrode and a collection electrode. The discharge electrode is usually negatively charged. The collection electrode is usually grounded. The applied voltage is increased until it produced a corona discharge which can be seen as a luminous blue glow around the discharge electrode. The corona causes the gas molecules to ionize. The negative gas ions which are produced migrate towards the grounded collection electrode. The negative gas ions bombard the particles suspended in the flue gas stream and impart a negative charge to them. Negatively charged particles then migrate to the collection electrode and are collected. An electrostatic precipitator has six essential elements. These are discharge electrode, collection electrode, electrical system, rapper, hopper and shell. The discharge electrode is usually a small diameter metal wire. This electrode is used to ionize the gas 9Which charges the dust particles) and to create a strong electrical field. The collection electrode is either a flat plate or tube with an opposite charge to that of the discharge elctrode. This electrode collects the charged particles. The electrical system consists of high voltage components used to control the strengthof the electrical field between the discharge and collection electrodes. The rapper imparts a vibration or the shock to the electrodes for removing the collected dust. Rappers remove dust that has accumulated on both collection electrodes and discharge electrodes. Hoppers are at the bottom of the ESPs and are used to collect and temporary store the dust removed during the rapping process. Shell encloses the electrodes and supports the entire ESP. The resistivity of dust particles drastically affects the collection efficieency of ESP. Resistivity describes the resistance of the collected dust layer to the flow of electrical current. Particles that have high resistivity are more difficult to collect than those having normal resistivity. High resistivity can be reduced by adjusting the temperature and the moisture content of the flue gas flowing into the ESP. However while adjusting the temperature and moisture, it must be ensured that flue gas temperature is above the dew point otherwise there will be corrosion of the plates. One of the important parameter in ESP design is the specific collection area which is defined as the ratio of the collection surface area to the gas flow rate into the ESP. Increasing the surface area for a given flue gas flow rate generally increases the collection efficiency of the precipitator.